Matt Conner (Seagal) was a good cop, but he got kicked off the force. Now a gambler and alcoholic, he still wants to be a good dad to his daughter Becky (Jordan). When a shadowy figure known only as “The Old Man” (Henriksen) offers to clear his gambling debts in exchange for a few “favors”, i.e., killing some gangsters around town, Conner agrees. Now dealing with complicated alliances between The Old Man’s henchman Blue (Calderon), Drea (Goldsberry), and fellow cop and husband to his ex-wife, Lt. Steve Shacter (Wilson), Conner has only his wits, propensity for violence, and considerable girth to help him through this mess. Connecticut is a small state and not a lot of movies (at least with high visibility) are shot here. So the good news is, they shot a movie in our lovely state. The bad news is...it’s Pistol Whipped! Yes, Steven Seagal comes to the Nutmeg state, and, well, left with all the Nutmeg. While, oddly enough, the CT can boast having the movies Friday the 13th (1980), I Spit on Your Grave (1978), and Last House on the Left (1972) shot here, thus becoming a hub for twisted “video nasties” of the 80’s, how far we’ve fallen when we now have to play host to a sullen Seagal. While shot in the towns of Bridgeport, Stamford and Norwalk (all fairly close to New York City), for some reason Matt Conner (or perhaps Seagal making an acting choice) has a Cajun accent. On top of that, he whispers most of his lines unintelligibly. You actually need the subtitles on the DVD. And when you read what he supposedly said, you say, “he said that? I didn’t hear it.” How did the subtitle people know he said that? And we watched it in surround sound! Dripping water was louder than Seagal’s voice. Or whoever’s voice it was. You actually need the subtitles so you don’t miss lines like “Clean as a Safeway chicken!”, whatever that means. But the point is, it seems Seagal was trying to channel the coolness of Michael Madsen here. But Seagal is so low-energy, he makes Madsen look like Richard Simmons. But it’s funny to watch not only his daughter, but the characters of Drea, and his ex-wife fall for his mumbly, unlikable charm. On top of struggling with the gangsters, he’s also struggling with his weight issues, as his flowy bowling shirts prove. But we don’t want to be mean and pile on with the “Seagal is fat” narrative (any more than we already have), because there’s plenty of other things we can talk about. Such as his odd hair, for example. Now, for Seagal standards, this movie is okay, but because it is an action movie from the 2000’s, it must have CGI silliness, fast motion, editing tricks, and green screen stuff. All of which, needless to say, detract from the movie. We suppose it was trying to be gritty, but the overall effect is more cheap and junky. Plus, the movie is repetitive and goes around in circles. And it’s repetitive. It would have been cooler if Lance Henriksen played the Matt Conner part, and Seagal played “The Old Man”. It was nice of Henriksen to show up for the few days he must have been there, but the movie could have used more of him. You probably have a decent idea of what to expect with Pistol Whipped (Spoiler alert: no one gets actually pistol whipped in the movie), so if you can convince a friend or two to spend some time with a newer Seagal (and a lot of alcohol), this might just be the pick for you. Go Connecticut! Also check out write-ups by our buddies: DTVC and The Video Vacuum! At least it's more "ok" than Submerged! Yeah, I'm on the fence about this one. Vern really liked it in his book Seagalogy - heralding it as something of return to form for Seagal. I just thought it was okay. At least, Seagal showed a little bit more range by playing a more complex character than his usual ex-CIA badass. And Roel Reine is one of the more tolerable DTV directors out there today. As far as recent Seagal goes I think Urban Justice (aka Renegade Justice) was his last halfway decent flick. Snake: Haha, definitely. Submerged is a tough sit. Jack: Urban Justice is one of his best recent ones...He should try to make more like that! I strongly disagree here, I think this one of Seagal's best DTV films. I also really dug Submerged. I think you should check out A Dangerous Man, Maximum Conviction, Born To Raise Hell, Driven To Kill and The Keeper, they were all pretty good. We haven't seen A Dangerous Man, The Keeper, or Born To Raise Hell, but we have seen Maximum Conviction and Driven To Kill and we thought they were ok and somewhat poor respectively. Of Steve's recent output Pistol Whipped seems to divide opinion the most. I've read some people argue that this is his best effort in years whilst others found as bad as some of his early 00's output. Personally, I thought it was better made. But I found it a rather dull watch. I enjoyed Driven To Kill more than this, probably because some plot elements were amusingly ridiculous. Which is odd, as this is a better film. I think I'm at a point where I'm not really sure what I want from Seagal anymore. I think I want well made stupidity, not well made seriousness. Although, having said that Taken is basically a Steven Seagal film. He could totally have done that role. As I say, I'm confused about what I want from the big man these days. If Steve can stick to being in decent DTVs like Into The Sun Or Urban Justice, we won't have to make fun of him. Taken and A History Of Violence are just fancy Steven Seagal movies. Haha. 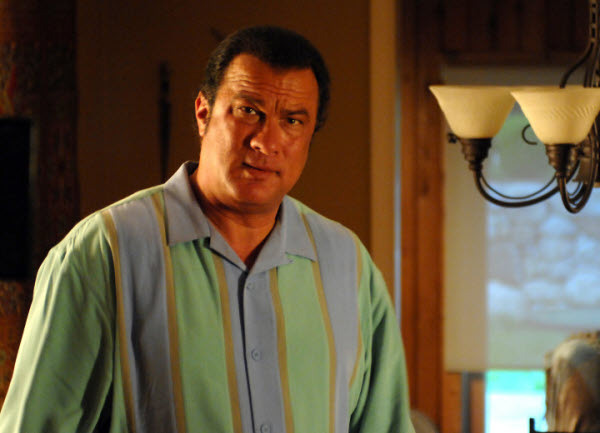 My problem with Seagal's DTV movies is that they have been unmemorable. They have all gone by in a flurry of flapping hands, quick edits and stunt doubles. His TV series True Justice is just more of the same. The best movies have been Belly Of The Beast and Today You Die. Seagal is lazy and maybe one day he can get out of his rut...but that seems unlikely based on his current course. We agree about Belly Of The Beast in that the main problem, his DTV stuff is unmemorable. 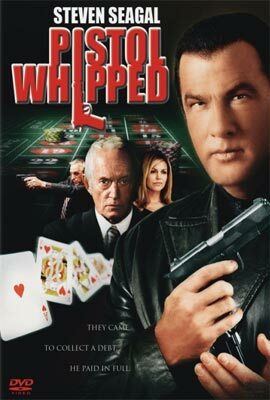 I disagree about Seagal being lazy, maybe with some DTV films but not all of them, Pistol Whipped felt like he put a considerable amount of effort into. The coolest part of this movie is that it was shot in CT! Haha. and it needed more Henriksen...if Seagal can bring more energy to his DTVs, that would help him a lot. I think PISTOL WHIPPED is one of Seagal's better movies. It's certainly the only 'flawed' character he's ever played. And for once (given the backstory) Seagal's weight actually works in his favour? For once he's not playing a black ops leader. He's playing a washed up alcoholic mess (can't say he doesn't look the part) and there's actually some genuine 'warmth' in the scenes with his daughter. A few 'avid farts' aside, it also contains some pretty good fight scenes. I can't force you to like the movie, but given some of his other DTV output, methinks you've been a tad unfair to this one? You make some good points. But something about the bad editing and CGI explosions just drove us crazy...there was no need for it.